I am not very pleased with the pictures that I have taken for today’s post. The decoration was not perfect as I made them in hurry for a party in my friend’s house. It could have been done much better. But since I won’t make them again anytime soon, thought of posting it anyway in the blog. Hope you would still like it. I know some of you may avoid cupcakes for its high calories, but I would suggest trying this out in moderate quantity. You will love it for sure. For me, who loves cupcakes and smell of coffee, would be very hard to resist from having it. 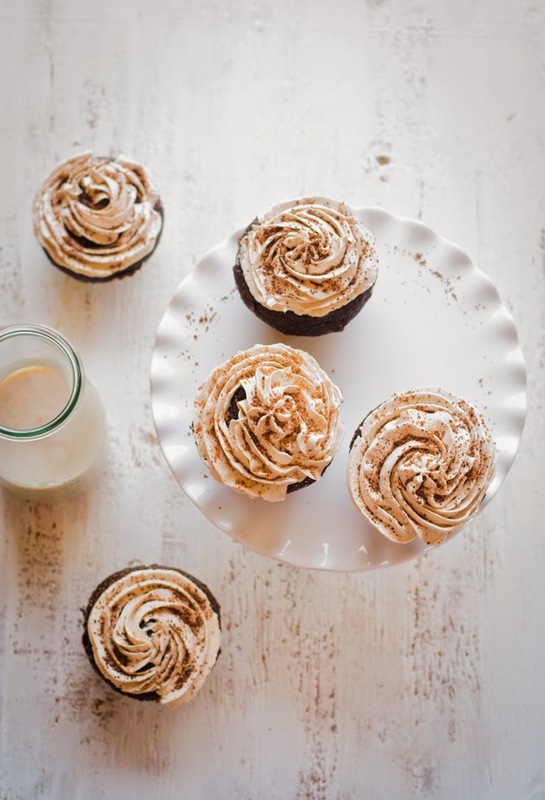 Today I will share the recipe of Chocolate Mocha Cupcakes with Espresso Buttercream Frosting. 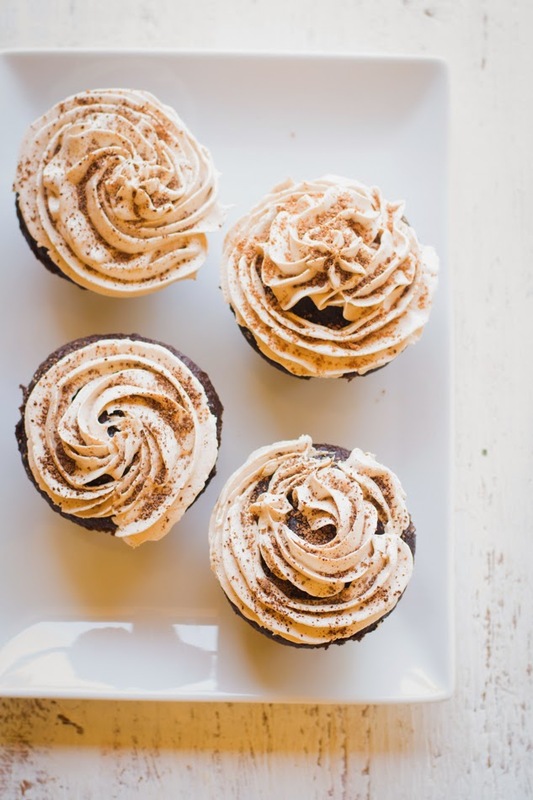 You can call it the recipe of popular Starbucks beverage in the form of cupcakes. I love to make cupcakes because they always come out beautiful just like a piece of artwork. You can decorate as your heart wants and make them adorable, pretty and delicious. Though this time I knew I won’t get enough time for decorating it, still it was in my mind since I had a delicious mocha cupcake at a local cupcake shop a couple of months ago and decided to whip up my own version. 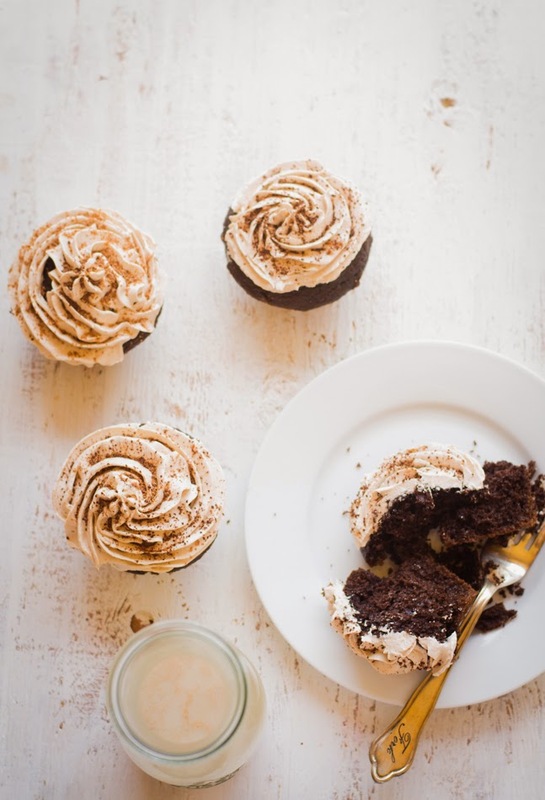 The base cake is a rich coffee infused chocolate cake and is topped off with a creamy, sweet espresso butter cream. As they were not decadent enough, I had to finish them off with a sprinkle of chocolate dust. Obviously this cake has two delicious flavors, chocolate and espresso, heavenly combination for them who love chocolate and coffee both! And what we can say about buttercream frosting which is always smooth, melt in mouth texture and dreamy in every sense. It makes the overall taste sinful, decadent and irresistible. 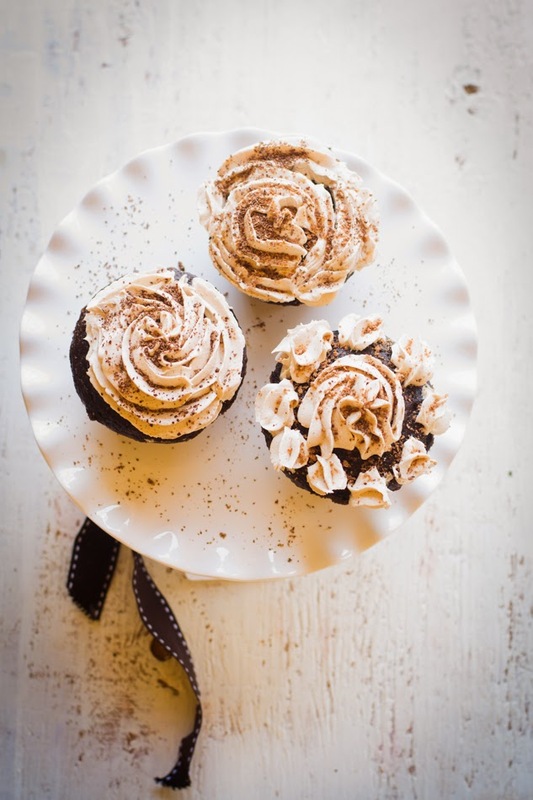 The making of these cupcakes are as simple as making the same with any box-mix. Just few minutes of effort but totally worth it. 1. Preheat the oven to 350 degrees F or 180 degrees C. Line a standard-size muffin tin with paper liners. 2. In a medium sized bowl, whisk flour, cocoa powder, baking powder, baking soda and salt together and set it aside. 3. Take a large mixing bowl, add oil and sugar to it and whisk it. Add eggs and vanilla extract and coffee powder and mix well until they are well combined. 4. Add the flour-cocoa mixture in 3 additions and alternately add water. Mix it well and scrape down the sides if needed. 5. Divide the batter evenly into the prepared muffin tin. 6. Bake for 17 to 20 minutes or or until a tooth pick inserted into the center of a cupcake, comes out clean. 7. Let them cool completely on a wire rack before frosting. 8. Whip the butter on a medium-high speed for 5 minutes. (You can use a stand mixer or electric hand-mixer.) Scrape the sides of the bowl. 9. Add the powdered sugar a little at a time and mix it well on low speed. Wait till sugar is mostly incorporated before adding more. Once the sugar has been added, increase the speed to medium-high and mix it well for 1 to 2 minutes, until it becomes fluffy. 10. Add vanilla extract and coffee powder and mix it until it becomes well-combined and smooth. 11. 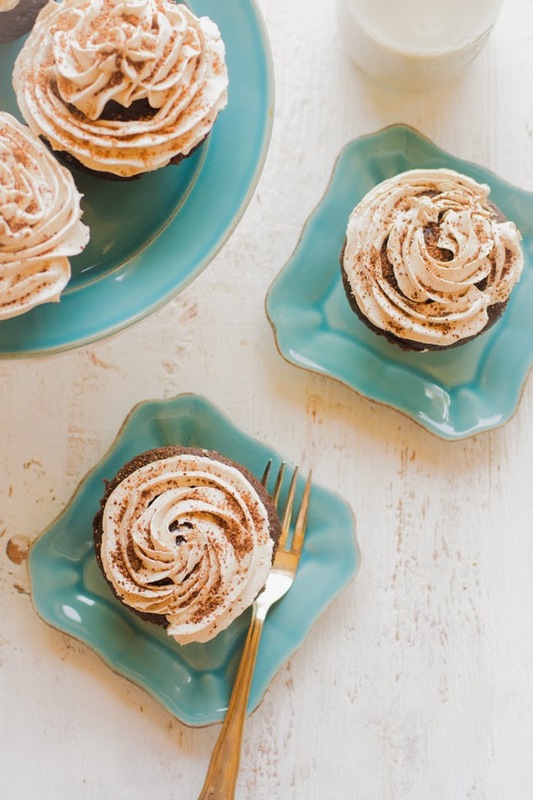 Frost the cupcakes with butter Knife or pipe the cupcakes with espresso buttercream frosting. Sprinkle some chocolate dust. Labels: baking, buttercream frosting, Cake, chocolate cupcakes, coffee flavored cake, cupcakes, Espresso cupcakes, Mocha cupcakes, Starbucks Mocha cupcakes. they say cupcakes could end wars of worlds ..so true !